Unwonted Studios is back with their latest Visual Novel, Catch Canvas. This is a simple story in which you’re the protagonist; an artist who seeks to be taught more by his famous uncles artist. However, you must first teach you uncle’s pupils before he teaches you personally, this is when things get complicated. This charismatic short adventure features peculiar relationships, interests and a few of the many obstacles artists encounter during their careers. You reach a beach house that works as the painting class, you must teach Estelle, a girl who at first sight seems like she only cares about her own beauty. Dawn, a very, very shy girl who has a lot of interesting traits hidden, and Nacchan, a girl who seeks to be a manga artist before anything. The class has work due in a very limited time, the three girls must finish to draw the statue of Mars the best they can, and it’s your job to teach them to work from the sketches to the final details while jumping over all the hoops they throw at you. The artist’s style reflects always upon his/her work, some find it more difficult than others, but practice and patience always prevails. The three girls feature 3 of the many problems artists encounter, “Disinterest, diffidence, and pride”. Some people show such a lack of interest in their profession, that it affects how people around perceive them. Being a perfectionist also brings about issues, generating unnecessary stress over oneself and being insecure in art is a no go. Pride can affect anyone anywhere in pretty much…well, anything! There will always be someone who can do the things you do better, it is your job to not be jealous, but to learn from them so you can improve and show what YOU can do that makes you unique. These are just scratching he surface of what your character teaches these three girls. At certain events he teaches them how the answers to the most difficult problems can be the simplest of solutions and most of the time are right under your noses. Of course as you already noticed, the art style of this VN is very anime-inspired. Featuring girls who are far more than attractive will obviously offer the classic fan service scenes, but hey, I believe to think these are merely to lighten the tense environment these characters are facing and also bring up the mood for humor. The whole aspect of the game is truly appealing to the eye, as it offers a warm yet contrasting color palette, an intuitive UI Hud for easy reading and a relaxing atmospheric soundtrack. 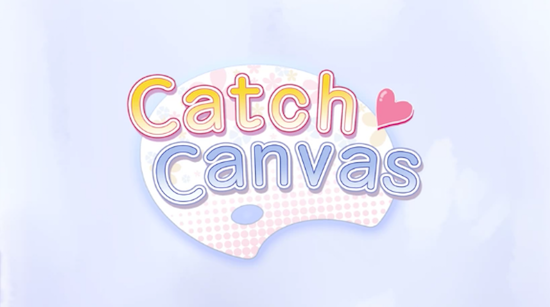 Catch Canvas is one of those simpler VNs that like most of Unwanted Studios games, they teach you valuable and relatable lessons through funny stories. Even though there really isn’t any branching in this VN, and your decisions really don’t matter or affect the story THAT much only until the end, it’s still very pleasant. I’d recommend this visual novel not only to artists seeking to solve their issues with this career/hobby, but anything who feels insecure in their own profession. Like in Catch Canvas, learning about your mistakes will eventually help you succeed.